So, I was about to say that Pi Day was my favorite nerdy holiday, but then I remembered Star Wars Day (May 4th) AND I just recently found out that my birthday is on Mario Day! (March 10 = MAR10) Woot! I’m totally making myself a Mario Cake next year! And while I would love to make pie on Pi day every year, I almost never do, since Pi Day shows up right on the heels of my birthday AND Hub’s birthday (his is just a few days before mine), so there’s usually still an abundance of desserts happening in my house. So I typically make a savory iteration of pie instead. I’ll often make Shepard’s Pie or Chicken Pot Pie or Mini Pot Pies! Umm..Yum! 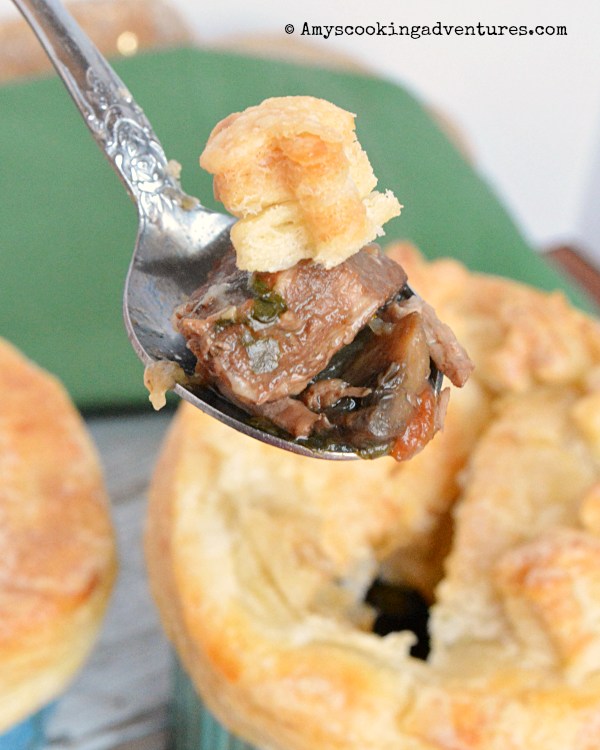 Plus it’s a Guinness beef stew, so it also ties in some St. Patrick’s Day fun as well! Place the butter in a large stock pot over medium-high heat. Add the beef, working in batches, if necessary, and brown on all sides. Set beef aside. Deglaze the pan with a splash of Guinness and add onions, celery, and mushrooms. Cook until the vegetables are tender, about 5 minutes. Stir in the tomato, herbs, and spices, remaining Guinness, broth, and worchestershire. Simmer for 45 minutes. Stir in the carrots, zucchini, and peas. Simmer for 15 minutes. Cut out puff pastry rounds ½-inch larger than 1-cup crocks. Divide the stew between the crocks. Cover each crock with a puff pastry round, pressing the edges around the crocks to seal. Heat the oven to 425 degrees F. Place the individual pot pies on the foil lined baking sheet and bake for 10 minutes. Reduce heat to 350 and bake for an additional 30-40 minutes. Allow the pot pies to rest for 15 minutes before serving. Place the butter in a large stock pot over medium-high heat. Add the beef, working in batches, if necessary, and brown on all sides. Set beef aside. Place the butter in a large stock pot over medium-high heat. Add the beef, working in batches, if necessary, and brown on all sides. Set beef aside. 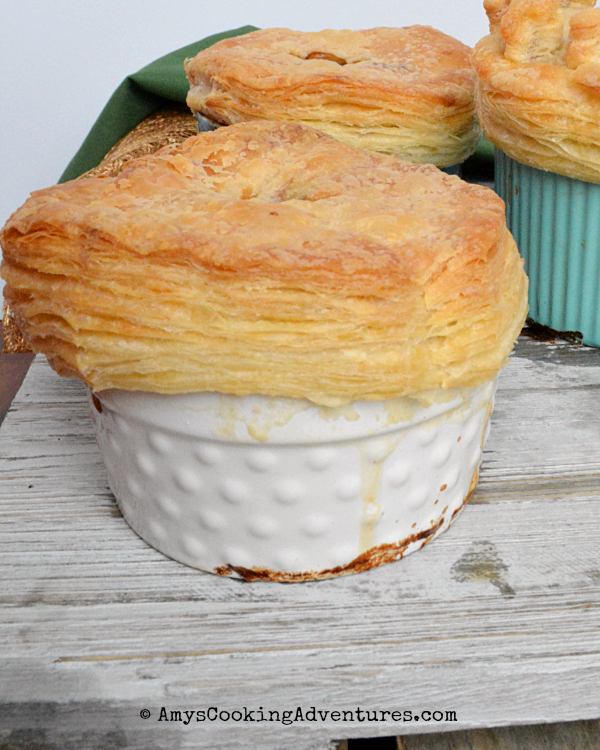 Cut out puff pastry rounds ½-inch larger than 1-cup crocks. Divide the stew between the crocks. Cover each crock with a puff pastry round, pressing the edges around the crocks to seal. Heat the oven to 425 degrees F. Place the individual pot pies on the foil lined baking sheet and bake for 10 minutes. Reduce heat to 350 and bake for an additional 30-40 minutes. Allow the pot pies to rest for 15 minutes before serving. This pie would be perfect for dinner tonight! Comforting, warming and delicious!! Your pastry looks fantastic! And the pie sounds tasty and hearty. Your homemade puff pastry is so impressive Amy. This has my name all over it! I LOVE having a savory pie! I cant wait to try it! Definitely need to try my hand at your homemade puff pastry, Amy! Thanks for sharing and, of course, anything with Guinness is awesome, too. Thanks. These are darling and sound amazing! 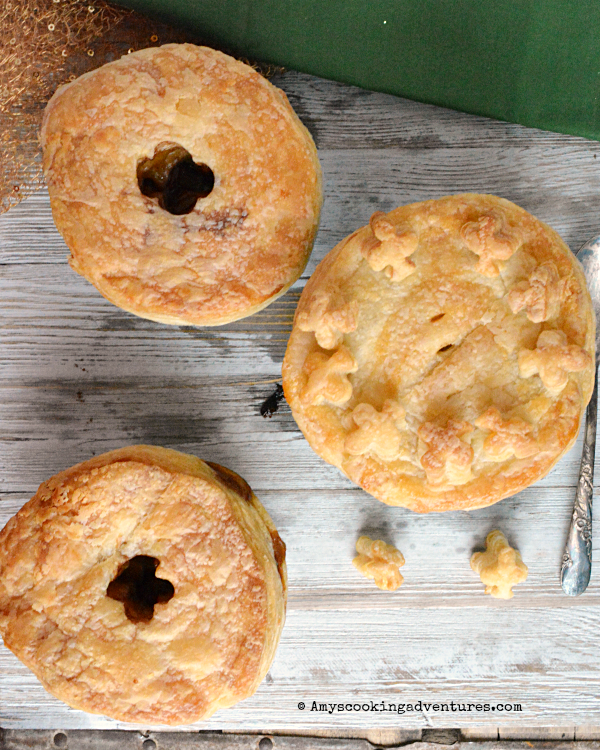 Love savory pies, especially pot pies! It's been far too long since I've had one and this looks great and what I'll need when it snows tomorrow even though it's supposed to be spring now.